As expansion of oil pipelines is reined in, oil trains are rolling out. Since last fall, the volume of oil shipped by rail from the Alberta Tar Sands and the Bakken Fields of North Dakota has increased dramatically. As Cory Morningstar reported in the April 12 edition of Counterpunch, this strategic shift in the delivery system from pipelines to trains heading for fossil fuel refining and export facilities has already made an end run around campaigns to stop new pipelines. The question now is whether British Columbia, Oregon and Washington State — the refining and export terminals destination for many of these oil trains — are capable of dealing with the consequences of suddenly becoming “crude zones”. All the evidence so far suggests they are woefully unprepared. In the May 15 edition of Bakken Oil News, it was reported that the Bakken Fields alone could bring upwards of 200 million barrels of crude oil by train to Northwest ports and refineries each year. While the first Bakken oil train arrived last September, all five Washington refineries handle or plan to handle oil trains. Five new terminals are proposed for Washington ports. 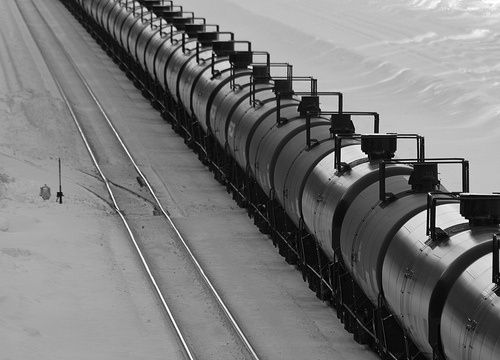 In 2008, railroads in the US carried 9,500 carloads of crude; in 2012, that number grew to 200,000. Due to the boom in fracking oil from shale, US oil production is projected by 2020 to exceed that of Saudi Arabia. As reported yesterday at Business Week, several big pipeline projects will be finished in the next couple of years, including the southern leg of Keystone XL. In the meantime, oil trains are on a roll. While Congress outlawed most exports of US crude in the 1970s, oil industry executives are making a case for changing that. Over the last several years, with refined products exempt from export restrictions, motor fuel exports have nearly tripled. Last fall, Oregon and Washington received just 50 trainloads of oil. If all the proposed oil terminals are built, that figure could climb to 3,000 oil trains a year for oil terminals alone, excluding trains delivering directly to oil refineries. All of that could come on top of the 7,000 coal trains a year to coal terminals proposed on the Columbia River and the Salish Sea. As reported in the May 20 blog of the Seattle P-I, the Affiliated Tribes of Northwest Indians (ATNI) passed a resolution opposing fossil fuel exports in their territories as a threat to their treaty-protected resources like endangered salmon. As reported in the May 18 edition of The Daily World, ATNI member Quinault Indian Nation — along with Audubon Society and Sierra Club — filed an appeal of Washington Department of Ecology’s approval of the first of three proposed oil terminals at Grays Harbor. As I reported at Intercontinental Cry on June 1, the 57 ATNI Tribes of Oregon, Idaho, Washington, southeast Alaska, Northern California, Nevada and Western Montana are already targeting investors in fossil fuel exports like Goldman Sachs. Whether the Wall Street/Tea Party/AFL-CIO convergence supporting fossil fuel exports will overwhelm the treaty rights of these tribes remains to be seen. Meanwhile, endangered species like the Orca whale and Chinook salmon persist, oblivious to the looming threat. This entry was posted in News, Top Story and tagged Exporting fossil fuels, oil pipelines, Pacific Northwest by Kim Kalliber. Bookmark the permalink.